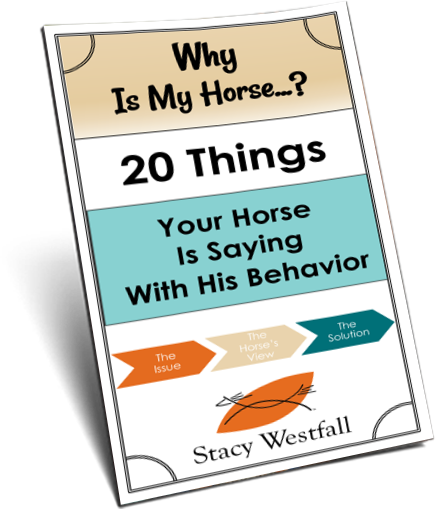 Do horses colic more in the winter? Do horses drink less water in the winter? Fact or Myth: Horses need less water in the winter. Horses at maintenance require a minimum 8-10 gallons of water per day regardless of temperature. Horses tend to drink less water as the temperatures decrease because of the water temperature. Horses prefer that water be 45-65 degrees F.
The use of heated water buckets or water heaters will prevent the formation of ice and keep the water temperature above freezing. Fact or Myth: The incidence of impaction colic increases in the winter. With the increased intake of hay, the incidence of colic does increase in the winter if horses are not consuming adequate water on a daily basis. Owners can encourage the consumption of water by adding electrolytes to water, providing soaked beet pulp or soaked hay cubes, or adding water to grain. 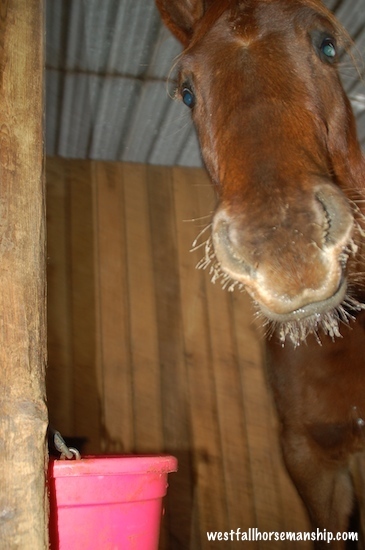 Have you ever noticed a decrease in the amount of water your horse drinks in the winter? Have you ever had one colic? Did you know that when I have a question I can ask a nutritionist? Did you know you can too? That’s right, check out this page on Buckeye Nutritions website and no matter what you feed-you can ask them questions! 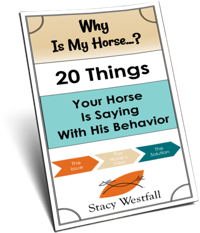 I had a horse colic because he wouldn’t drink ice water! We now use heated buckets in our stalls and though they are outside the majority of the time, we bring them in twice a day to eat and insure they are drinking and pooping. i to see increase on water intake in colder weather ,,because they are eating way more hay to stay warm ,,,,lots of salt and minerals also ,,as well as beet pulp ,or soaked cubes or pellets!! My horses seem to drink more water in the winter vs. the summer! have 4 horse all drinking very well except the 30 year old gelding ,heated bucket and some days he doesn’t drink a drop ,uuggg he gets a gallon water in his mash and also soaked beet pulp ,so far so good but boy I do worry im going to find him down,i also keep a bucket unheated and have added apple juice to try to get him to drink ….come on spring !!! Here in Maine my horses do indeed drink about twice as much water in the winter. I also noticed that once I went to heated stock trough they drank even more. I have always worried about winter colics as I feed a lot of hay stretcher pellets (which get wetted down) with free choice hay and feed regular bran mashes as well. Here in Golden, Co…. my horses always drink twice the amount of water in the winter, as do our other animals. interestingly enough. I have found my horses are drinking more this winter apparently due to the drier air. we have heaters in our tanks and one we add warm water to one twice a day cause it doesn’t have a heater. I’ve not noticed my horses water consumption decrease in the winter… They tend to drink large quantities anytime of the year as long as it’s clean and free of debris. I did have a horse (rescue mare) that absolutely refused to drink out of a heated water bucket. I had to rotate her bucket twice a day when they froze. Laura Flores. We have 26 horses. 3 of them will not drink from a heated bucket even though t g eyes are dumped and cleaned daily. I add a second bucket for those horses. (Interestingly, all mares). We are using a heater in our water trough, and I think our horses are actually drinking more this winter with the extreme temps. I’m not sure why, unless it helps warm them up just like drinking something warm helps us..